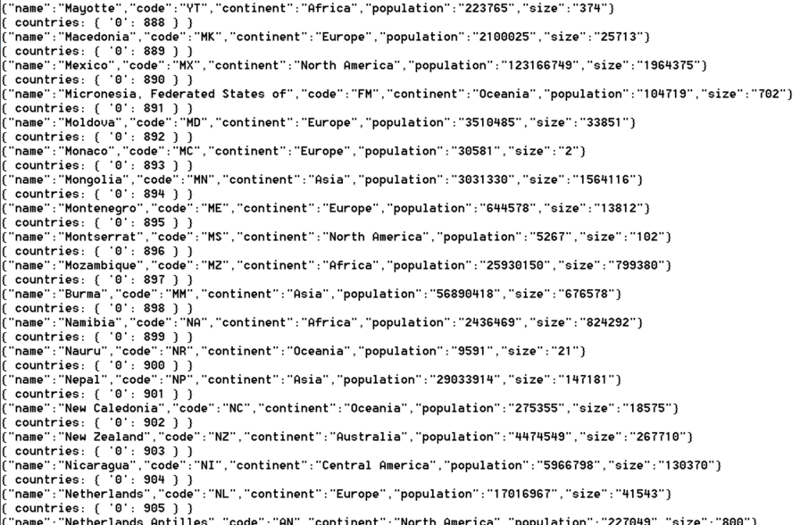 NodeJS – Publish messages to Apache Kafka Topic with random delays to generate sample events based on records in CSV file – sources for a NodeJS application that produces messages to a Kafka Topic; these messages represent countries and carry some country details (name, continent, population, size); these messages are used as the source for the streaming analysis presented in the article you are now reading. 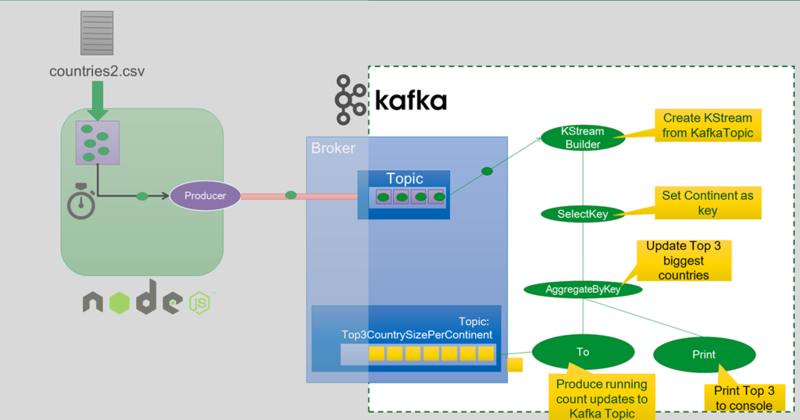 This GitHub Repo contains the sources for this article: https://github.com/lucasjellema/kafka-streams-running-topN. Note that almost all aggregations are specializations of this top-N: min, max, sum, avg and count are all simple top-1 aggregations that can be implemented using a simplified version of this code. To get started, go through the steps described in my previous article. This will result in an App.java class, that we can flesh out. 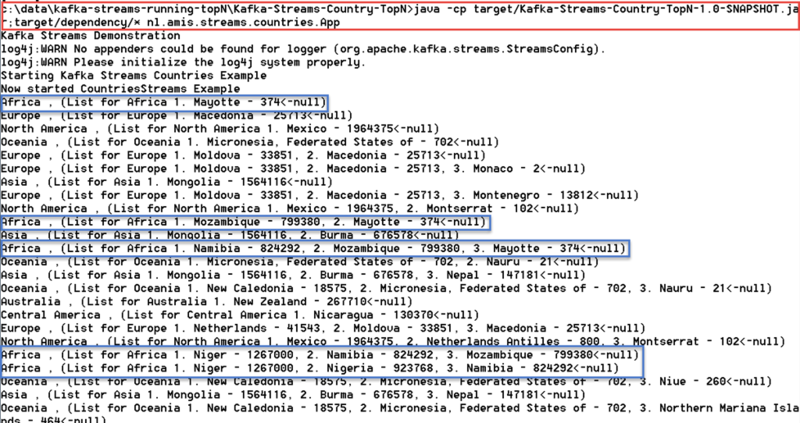 aggregator implementation in lambda that performs the actual aggregation – the operatoin aggregateByKey (aggregateByKey) is invoked with an Initializer(Initializer) that returns the initial instance of the CountryTop3 object (per continent) on which the aggregate will be built, an Aggregator (Aggregator) that receives the continent, the CountryTop3 object and the next CountryMessage and upgrades the CountryTop3 object to include the new CountryMessage, the Serdes (serializer/deserializer) for the key and the value and a String that is the name of the resulting KTable. 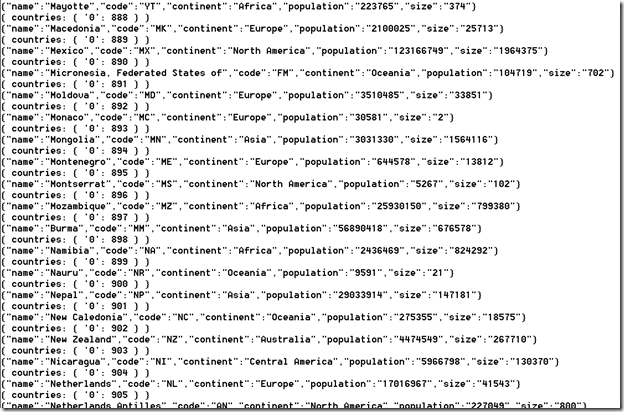 mapValues in order to create printable strings from the CountryTop3 object – the Lambda expression used in the call to mapValues gets a CountryTop3 object as input – the value in the top3PerContinent KTable – and maps it to a String. As a result, the KTable <String,CountryTop3> is mapped to a KTable<String,String> that is streamed to the print operation, using the stringSerde for serializing the two String values. Note how Mayotte enters at position one for the African continent, only to be quickly relegated by first Mozambique and then Namibia, only to disappear from the running top 3 when the message for Niger is consumed in the stream. You should also know that instead of simply pushing every change to the destination topic, we can using timing control – to calculate aggregates over a time slice and or produce outcomes only once every so often. I will demonstrate this is in a subsequent article. 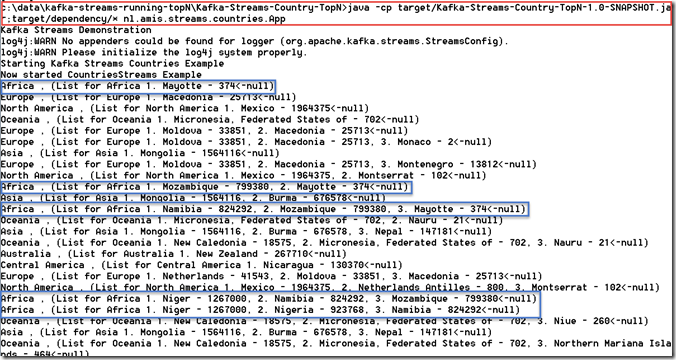 countries-topn-streaming-analysis-app-Top3LargestCountriesPerContinent-changelog is a Topic created by Kafka Streams on the fly as store for intermediate results; the name of this Topic is derived from the (intermediate) KTable create in the streaming application. 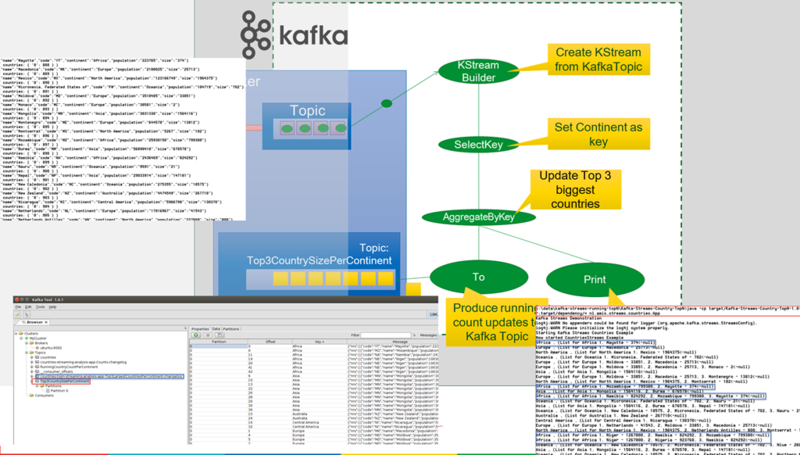 By routing the KTable to a Topic, all change events on the table are produced to the Topic. What I would have liked to be able to do is have only the latest message for each key – in this case the most recent top 3 for each continent – on the Topic. That is not what Kafka Streams does for me, not even when I am producing a KTable as opposed to a KStream. One thing I can do in this case is enable Log Compaction for the topic – although that is more like a hint to the Kafka engine than a strict instruction for removing older messages on the Topic for a key. An interesting resource is the Kafka Streams example KafkaMusicExample.java on generating a running Top 5 of all songs being played. The code block isn’t rendered properly. You are right Preetam. I have corrected it now. Thanks for the warning.